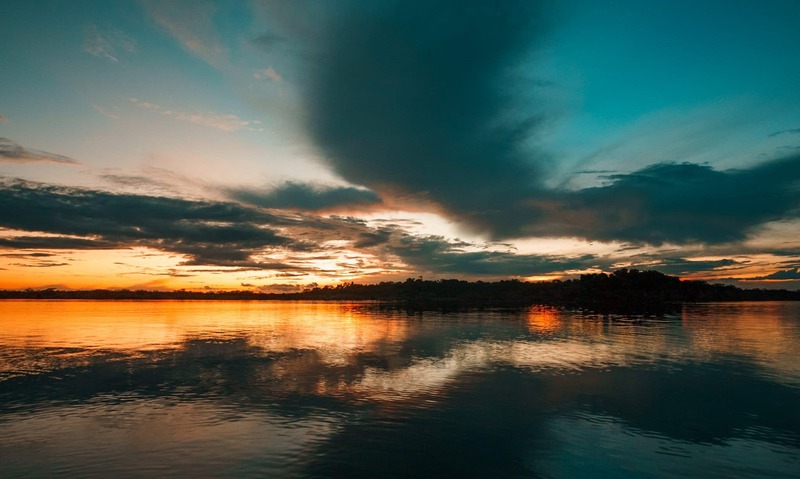 Spanning over 5.5 million kilometres between several countries, the Amazon or Amazonia is one of the most impressive landscapes in the world that both excites and terrifies. Home to the rare and camera-shy pink freshwater dolphins, hundreds of bird species, several kinds of monkeys, and the fear-inducing anaconda – a snake that can grow to measure 12 meters long, the Amazon is one of the world’s best wild places. 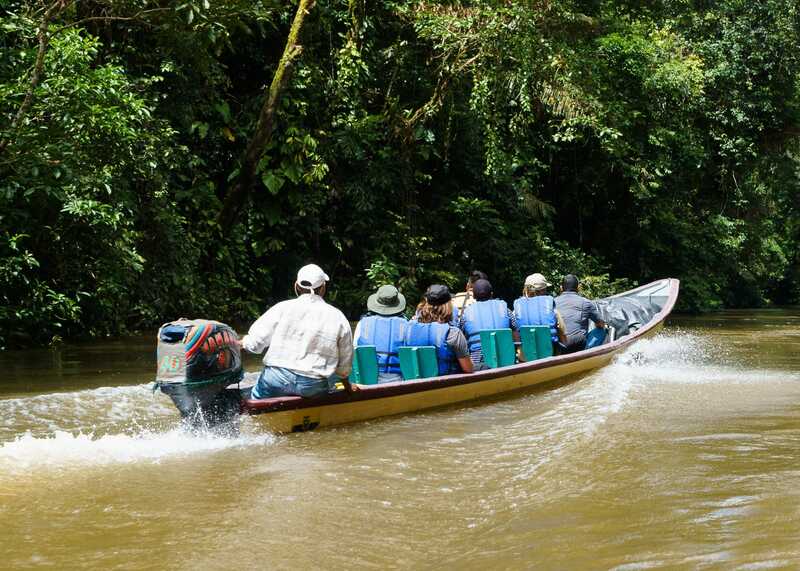 A great way to visit this incredible region is to do a tour organized by one of the many riverside eco-lodges that adorn the banks of this mighty watershed, which is exactly what we did recently during our 5 day stay in the Cuyabeno Wildlife Reserve in Ecuador. 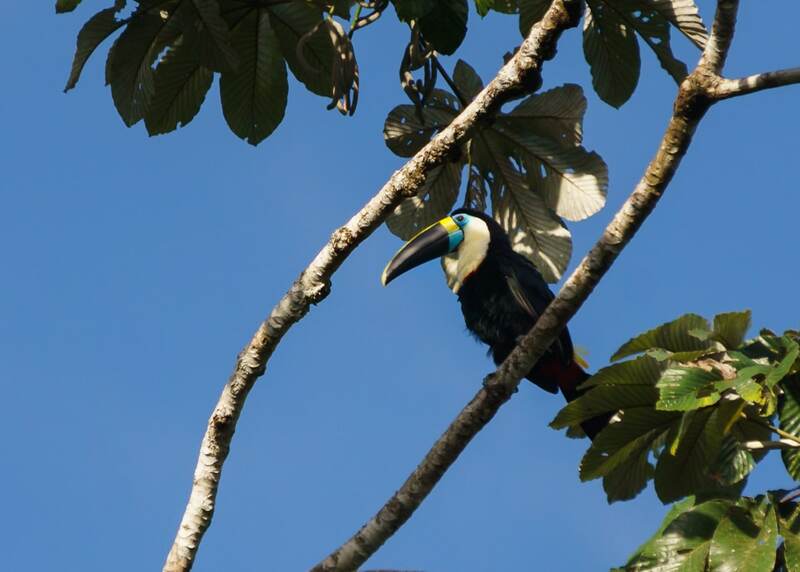 Why Do an Amazon Tour in Ecuador? The Cuyabeno River is an important tributary of the world’s second longest river nestled against the foothills of the Andes. Its unique location and slightly cooler temperatures mean that its species composition differs from other upper Amazon watersheds. 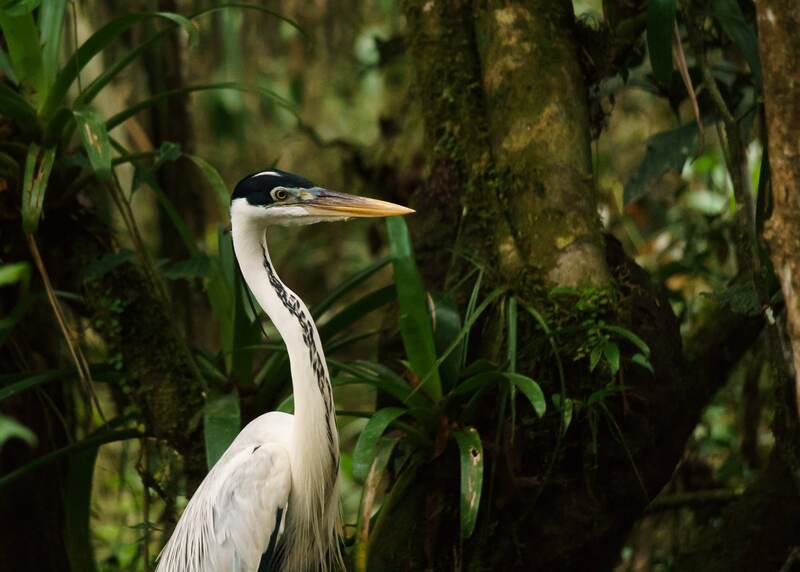 A 12 hour journey from Quito, it is delightfully remote and the wildlife viewing possibilities are endless. 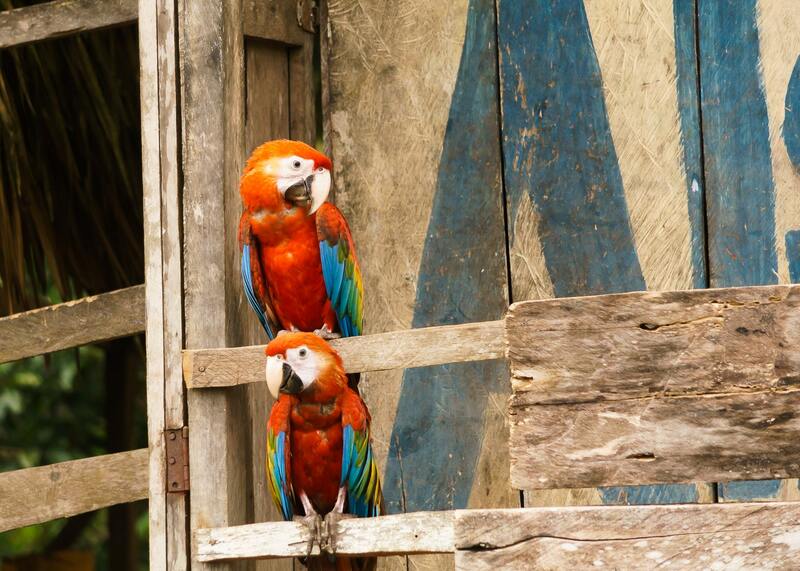 If a rustic and budget-friendly Amazon rainforest adventure is your style, head to Cuyabeno. 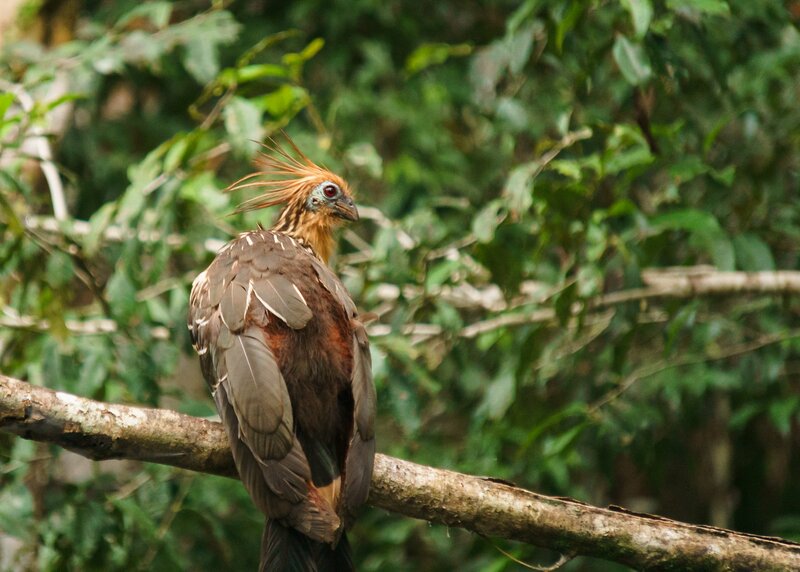 Yasuni National Park in the Napo River region is for those seeking a luxury experience. Cuyabeno means “kindness river” in the local Siona and Secoya Indigenous peoples’ language. 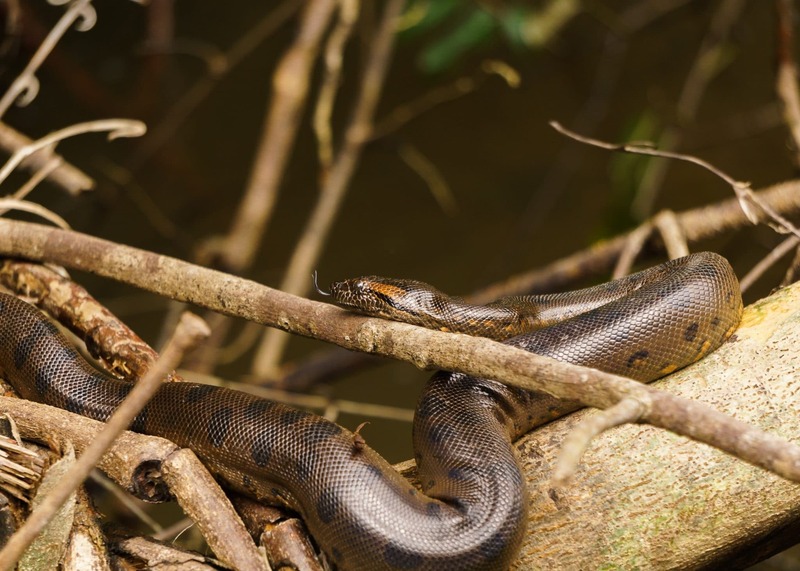 While this river may provide them with the food that they need, it is also home to some seriously frightful creatures such as anacondas, boas, caimans and piranhas to name just a few. No need to fear though, during the tour you will be doing most of your wildlife spotting from a safe distance in a boat. 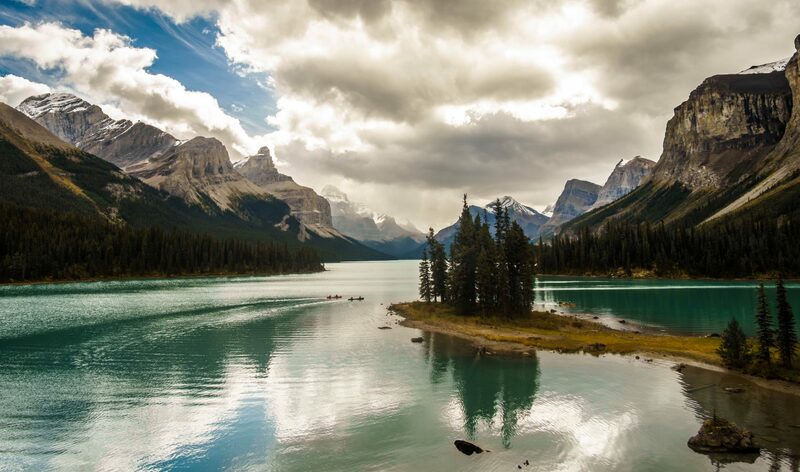 Tours can be 3, 4, or 5 days long and most seem to have similar itineraries that include daily wildlife viewing from the boat, some combination of day and night walks, canoe trip, as well as a visit to the local Indigenous community. We did a 5 day tour but felt like a 4 day may have been enough. 3 days seems too short given what an ordeal it is to get there. As for the activities, by far the best wildlife viewing is from the boat. 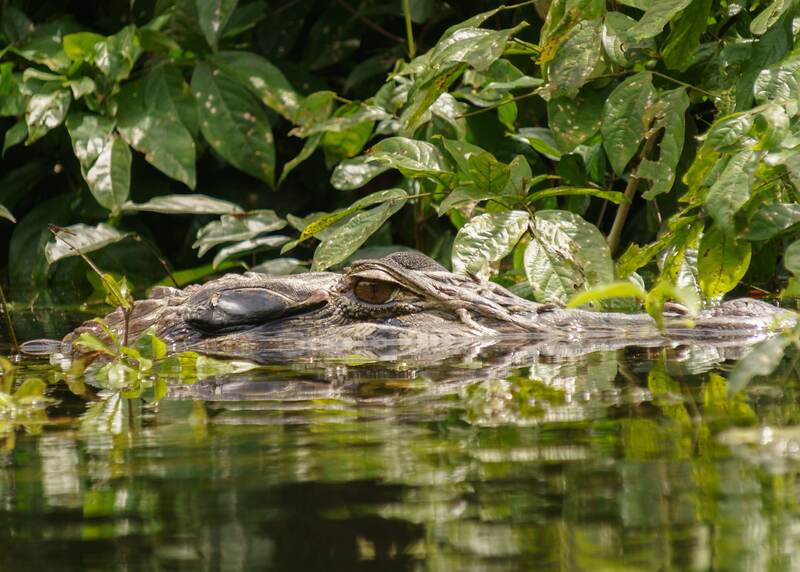 We saw dolphins, 2 kinds of sloths, 7 kinds of monkeys, small anacondas and boas, bats, tarantulas, 2 kinds of caimans, and an incredible variety of birds during our boat cruises. Photographing wildlife on a boat is a bit tricky at times and don’t expect all of the wildlife to be close, so packing binoculars would be a good idea. We like these ones because they’re waterproof and compact. The wildlife viewing was rather limited during the walks and for the most part our guide Camill told us about plants and insects. Our least favourite part was probably the nature walk in the day where we were purposefully led into a muddy swamp while the guide filmed us all falling over and crying about how gross it was. The night walk on the other hand, was pretty cool. We saw a cute baby caiman, and a tiny, sleeping bird that didn’t seem to care that we were stomping right by while it slumbered. Most importantly, we weren’t purposefully led into a swamp. We also did a night-time boat cruise where we looked for animals, including the big snakes, but instead we saw a spectacled owl, paruque, a snake so small that I have no idea how our guide could have possibly spotted in the dark from a boat, and a monster-sized black caiman. The trip to the Indigenous community was a unique experience where we harvested and made yucca bread, had a delicious lunch, and sampled some powerful traditional medicines that gave us a nice afternoon buzz. Don’t volunteer for the pain treatment unless you want to be slapped with stinging nettle for 10 minutes straight. I did volunteer to have my energies read by the shaman, who told me that I “had good energy.” But I bet he tells that to all the girls. Most days often featured a sunset cruise to the lagoon where you could spot wildlife including the freshwater dolphins and swim if you were so inclined. This was usually my favourite part of the day, and if the skies were clear, the stars were incredible for the ride back to the lodge. 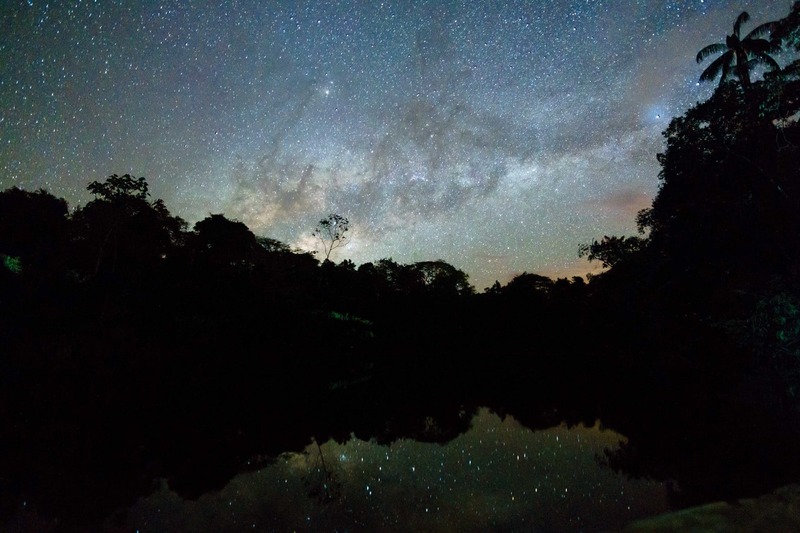 Amazing stars in the Amazon! On your last day, you may also have the opportunity to do an early morning cruise before your departure after breakfast so long as it’s not raining. Unfortunately for us, it was absolutely pouring so we all went back to sleep. The last day wasn’t a total bust though and we saw some interesting wildlife on the way back out of the Amazon, including two young anacondas hanging out together which is a unique sight as they are typically solitary animals, and yet another species of monkey: the red-coloured monkey. While the nature walks were a little underwhelming, the wildlife viewing from the boat during our 5 days in the Amazon was amazing and we loved the laidback pace of the place. We felt sufficiently recharged having spent almost a week in this remote, wild region. Hostels in Quito will have information on different tours and lodging available in Cuyabeno, as will any of the tour operators you see in the street. You can also email the lodge directly which is what we did. Regardless of the lodge you book with, most of the tours will be roughly the same and will include some guided walks, daily trips to the lagoon (during wet season), wildlife watching from the boat, and a trip to the Indigenous community. Be sure to shop around and don’t be shy about asking for a better price. We were able to knock $40 off the price we were originally quoted by doing this and our 5 day tour at Cuyabeno Dolphin Lodge cost $310 per person as of May 2018. The only place we saw a lower price was through Blue Hostel in the Mariscal Foch area who offered one for $305, but I don’t know which lodge it was with. 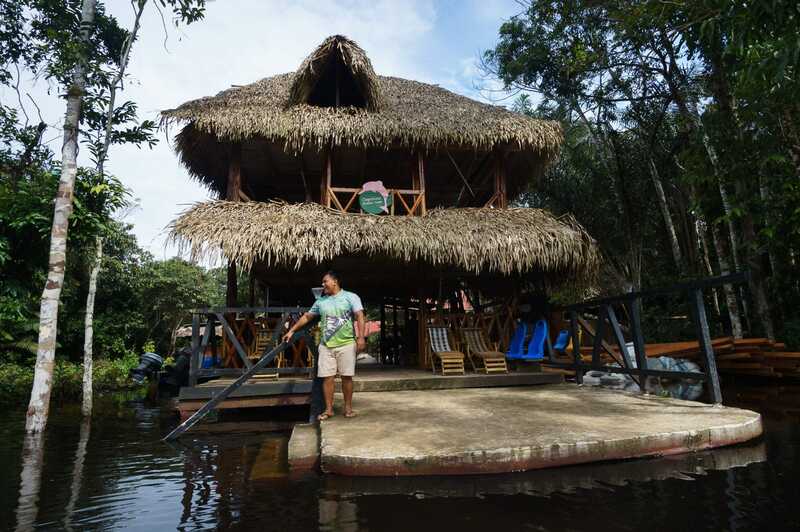 The Cuyabeno Dolphin Lodge is built up on a marshy area and its dock reaches the river’s edge. We visited during the wet season which is better for viewing certain animals like the dolphins, but less ideal for seeing the massive anacondas that spend their days submerged in the river *shudder*. The lodge lived up to its name and we could see a small family of dolphins feeding in front of the lodge from the dock pretty much every morning. 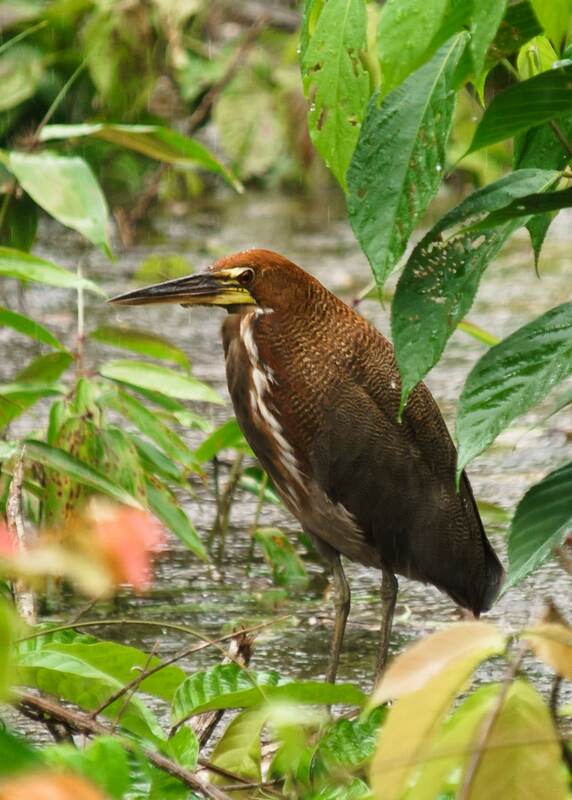 Tiger herons, orange-fronted parrots, and a beautiful rainbow boa could also be seen right at the lodge. The rooms are very rustic which means the rooms are open-air, so you don’t have a full wall between you and your neighbours, you will hear everything they say and do and I mean everything. One man’s snoring echoed throughout the whole lodge. Our room also had a resident spider that we let chill in his web because we figured that he was eating other bugs, and a bat that sometimes flew out from under the bed who we also welcomed for the same reason as the spider. As for mosquitos, there were surprisingly few at the lodge. The only annoying bugs were the harmless black flies that bothered us for breakfast every morning but thankfully, disappeared for the rest of the day. Despite the rustic feel, the lodge is comfortable and we didn’t find it too hot despite not having AC. Also, there is no Wi-Fi so enjoy the chance to unplug. Since it runs mostly on solar power, some rooms seemed to never have hot water, but I always managed to have a hot shower. Luck of the draw maybe? The food was great and exceeded my expectations for a budget lodge deep in Amazonia. Breakfasts usually included eggs, fresh juice, fruit, and cereals. Lunches were usually some kind of stewed meat with rice and salad, and dinners featured soup and popcorn to start, followed by rice, beans, salads, and some tasty kind of meat. They can accommodate both vegetarians and vegans as well. Other features of the lodge that I loved were the hammocks for siesta time and the dock was a designated yoga area which they even provide the mats for. It was pretty amazing to be able to practice yoga as dolphins surfaced in front of you. Camill was our guide for the duration of our stay and he was a wealth of information who kept us both informed and happy during our time there. Overall, we were very happy with our experience at the Dolphin Lodge and would be glad to stay there again. We might skip the nature walk through the swamp though. 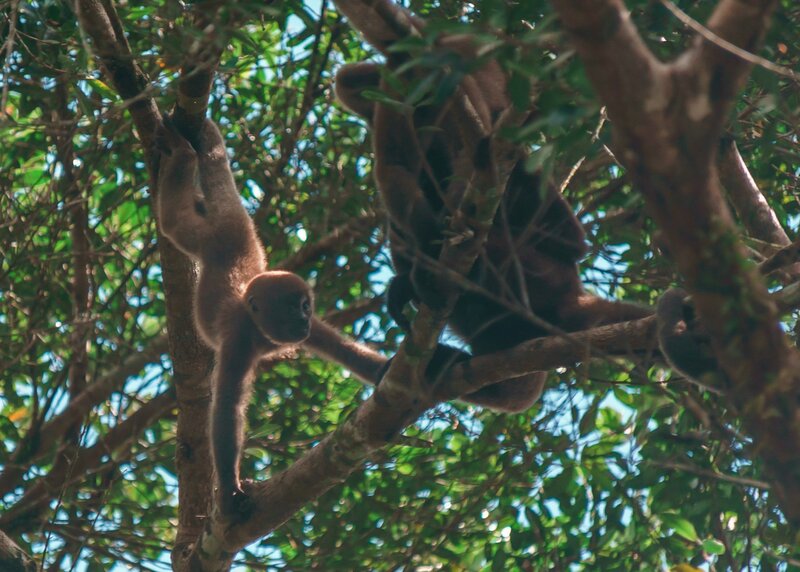 Cuyabeno can be visited year round, but the best wildlife viewing is during the “wet season” which typically begins around mid-March and ends in November. That said, if you have your heart set on seeing a monstrous 12m long anaconda, the dry season is better for seeing them as they move across the land to find food. It’s hard to imagine, but Camill told us that the beautiful lagoons we visited every night during the wet season completely dry up and become soccer fields. Cuyabeno is generally only accessible by a shuttle from Lago Agrio (also Nuevo Loja) that will be arranged by whatever lodge you are staying with. In our case, we stayed at the Dolphin Lodge who arranged for a van to pick us up at Hotel Di’Mario in Lago Agrio. Many hostels will be able to set up the tour for you in Quito, and may also offer a shuttle to Lago Agrio. This will often mean an overnight bus or van ride that gets into Lago Agrio early in the morning. It costs about $20 per person and takes 7-8 hours. Hoping to avoid a sleepless night in an uncomfortable van seat, we took a day bus from the Quitumbe terminal. The bus was “Firts Class” and even had sort-of functioning Wi-Fi, but I narrowly avoided being pick-pocketed so be sure to keep your belongings close when taking the bus. Otherwise, the ride was uneventful and comfortable, albeit the winding road through the mountains can be a bit stomach-churning. The bus costs $12 per person but do keep in mind that a taxi from your hostel in Quito to the Quitumbe terminal can be $20 so for the 2 of us there wasn’t much savings in taking the public bus rather than a shuttle organized through the hostel. We did it more so that we could travel during the day allowing us to see the beautiful scenery outside, and then stay the night in Lago Agrio so we would be well-rested for the first day of our Amazon tour. On the main street there are numerous hostels that rent a room for $20 or less per night. We stayed at Hostal Heliconas which is run by a nice family and features a good-sized room with AC, private bathroom and hot water for $20 USD. There are also some restaurants and street food options nearby, as well as a supermarket if you want to buy snacks for the Amazon. Overall, Ecuador is a very safe country to travel in but Lago Agro is not considered safe for tourists after dark and pick pockets are a risk. Keep your belongings close and stay in your hotel after the sun sets. Hotel Di’Mario was a short 5 minute walk up the street from Hostal Helicionas and that is where we met our driver who would take us another 2 hours toward the Cuyabeno River. After a second windy ride through the mountains, we stopped at a bridge where we boarded a boat to make the 2 hour upriver trip to Dolphin Eco-Lodge. Keep in mind that if you do the overnight shuttle you will be in transit for over 12 hours straight. 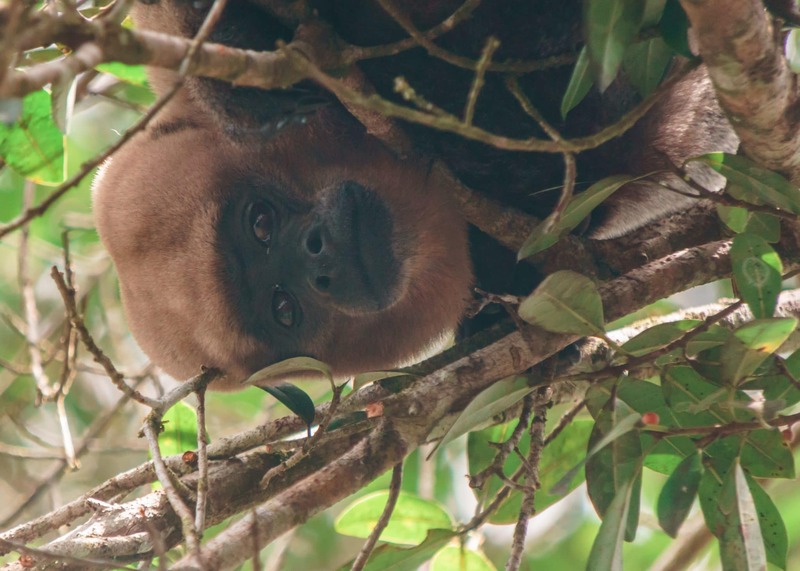 That said, once you’re in the boat it’s a nice journey up the river and we saw many different monkeys, snakes, birds, and a 3-toed sloth on the way in. After a long day of travel, a delicious lunch was served at the lodge and then it was siesta time until we started our first activity once the heat of the day had passed. Ecuador’s Amazonia region is a remote rainforest so it is very wet and electricity infrastructure is limited. We recommend packing a rain-jacket, although most lodges will provide rainboots and ponchos, it will be nice to have one for the walks where the poncho is too heavy. We also recommend bringing a battery pack like this one to charge your devices since there will be a run on the outlets at the end of the day and the lodge may rely on solar which can be limited. Also useful is a headlamp or lantern for the dark nights. If you need to leave your room after dark, it may be best to scan where you’re walking for creepy critters. A rainbow boa was found under the steps to the kitchen for example, eek! 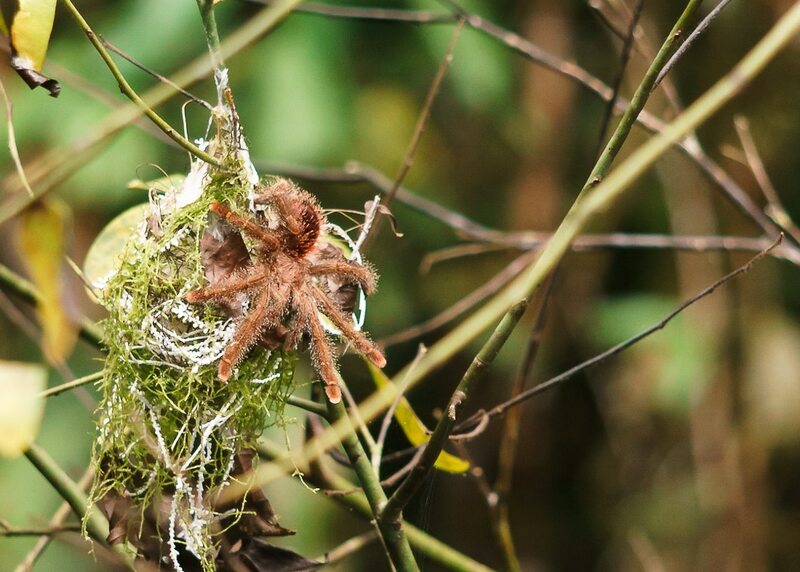 Tarantula – one of the many creepy crawlies in the Amazon! For wildlife viewing, we’ve already mentioned the Nikkon Travelite waterproof binoculars for getting a better view of the animals hiding up in the treetops, but they’re so handy they’re worth mentioning again. They’re lightweight, bomb-proof, waterproof, feature clear vision and are a good value option. Lastly, you may want some dry bags to store your phone and camera when you’re on the boat. A simple waterproof bag will suffice for small items and we like our Peak Design Everday Sling for protecting all our camera equipment. If we’re really worried about how wet it’s getting, we sometimes cover it with a waterproof backpack cover for extra protection. Overall our experience in the Amazon in Ecuador was amazing. We were impressed by the endless diversity of wildlife that can be seen in the area, as well as awestruck by Cuyabeno’s raw, natural beauty. If you’re looking for a chance to recharge in nature, get well off the beaten path, travel responsibly in a unique ecosystem, and see 17 different species of birds and animals before lunch, head to Ecuador’s Amazon region. Just watch out for the snakes! Would love love to visit the Amazon! We just had some friends that came back from Costa Rica. My husband and I are huge birders and herpers. So going to the Amazon would be a perfect place to vacation. 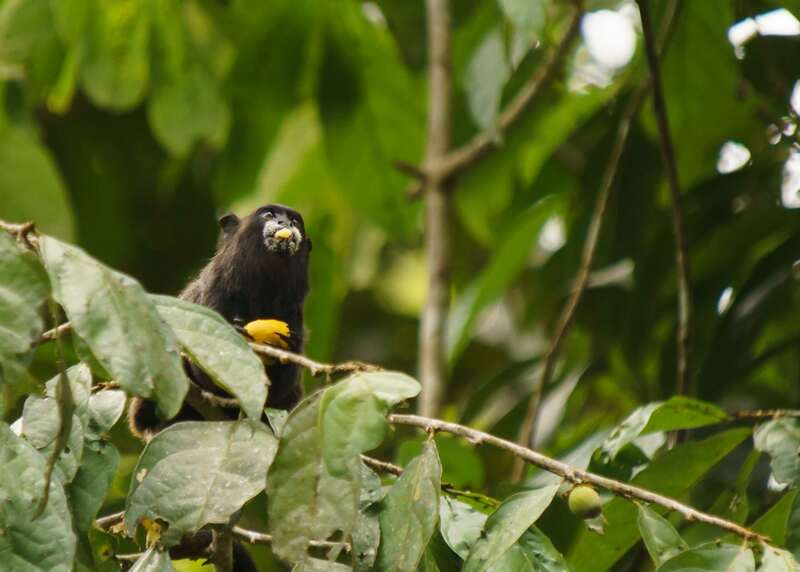 If you like birds you should check out Mindo too!